Skunk2 is proud to introduce its all-new Oil Cooler Kit. The kit includes a sandwich adapter which is made from 6061 Aluminum, CNC machined and then hard-anodized. Skunk2’s Oil Filter Sandwich Adapter features a 1/8 pipe port to feed a turbo or the addition of a pressure gauge. The Skunk2 Oil Cooler Kit fits the Kraftwerks supercharger kit and has been ran and tested on Kraftwerks very own vehicles. The Oil Cooler features 19 rows of fins and sits torwards the front of the bay where most cooler and filtered air is located. The positioning of the Cooler allows for cooler air which then results in cooler temperatures. The cooler it self measures at 11.25”x5.5” with -10 outlets and is 2” thick. 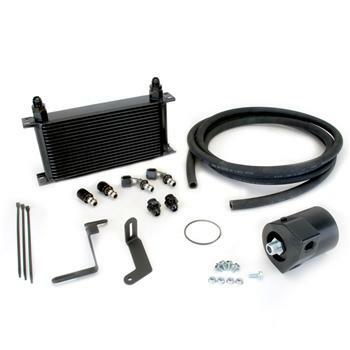 With all these features combined the Skunk2 Oil Cooler Kit stands apart in performance and quality as well sleek appearance in comparison to any other cooler out in the market.